We take our smartphones everywhere we go, and with their powerful processors and LTE connectivity, they can be indispensable as personal assistants and productivity aids. If you're aiming to get more done on the go, adding some apps to your mobile device can be a step in the right direction. Here today we will introduce to you an incredible productivity app that will help you to take charge of your mobile device and fix all problems that may cost you malfunction or low functionality. Namely, we talk about the Phone Booster App, a perfect mobile software tool, phone performance optimizer and phone junks cleaner which will make your Android’s performance top notch. Sound interesting, doesn’t it? It’s free to download and offers several quite helpful tools to improve your mobile software health and create the conditions for its peak performance. 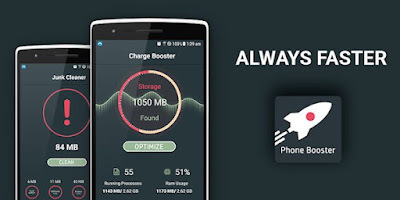 Phone Booster features the charge booster tool to ensure effective charging, optimize and close battery draining apps while charging to prevent overheating and overcharging. For optimizing phone memory, automatically close unwanted background running and power consuming apps use the battery saver option. The other amazing tools are the CPU Cooler tool which will help you to prevent overheating and cool down CPU temperature and the junk cooler tool to remove the unwanted junk files, residual files, device’s caches and temp file. No doubt Phone Booster is a great deal of a productivity app that shouldn’t be missed. It’s available on Play Store so it will be a wise step to download it immediately and say thanks later. Get it, use it and enjoy the top performances of your Android device!